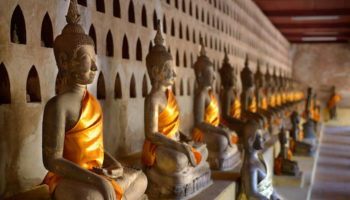 Vang Vieng is the place to go in Laos if you are interested in exploring what the natural landscape of this Southeast Asian country has to offer. 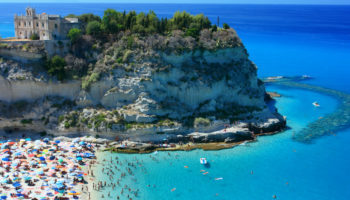 With rivers and streams snaking through a limestone karst landscape strewn with caves and rice paddies, this town was once known for a hedonistic backpacking scene but has since reinvented itself as one of the top adventure holiday destinations in the region. 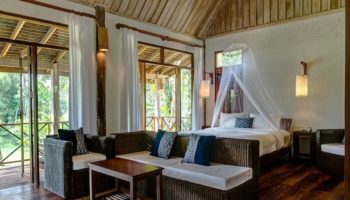 Staying in Vang Vieng means soaking up that spectacular scenery from the comfort of a rustic riverside bungalow or a high-end resort complete with tropical gardens. 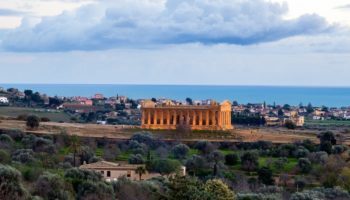 Whichever you choose, near the eateries of the town itself or a more tranquil setting on the outskirts, you’re bound to be pleasantly surprised by the price. A modern, smart hotel, this place is clean and comfortable with chic rooms boasting wooden floors, en suite bathrooms, and hardwood furniture. There is a large outdoor swimming pool surrounded by a sun terrace, plus a hot tub for extra relaxation. Breakfast is served up each morning at Eden de Vang Vieng Hotel in the dining room, which is good to fuel you for a day of exploring the surrounding nature. Though a little far out of the center of town itself, this hotel is located near the bridge that leads to the Blue Lagoon; guests can hire bicycles from the hotel and cycle there! This is a charming, traditional style guesthouse with rooms featuring parquet floors and wood ceilings – complete with fans. Some rooms even look out onto the Song River for a relaxing view. The riverside location also provides a spectacular spot to enjoy dinner along the water’s edge in the veranda restaurant. There are magical views of the karst mountains that jut out of the landscape all around. In terms of location, there is a cool Organic Mulberry Farm within striking distance, plus the Tham Chang Elephant Cave is less than a mile away. Villa Nam Song is a cozy, convenient, family-run hotel to base yourself at on your Vang Vieng trip. Magic Monkey Garden is set in a quiet location – in beautiful tropical gardens – away from the busy streets of the center. Mixing the budget accommodation of a hostel with the friendliness of a guesthouse, this lodging offers up both dormitories and private rooms. Both of these feature tiled floors, hardwood furniture, and white linens for a comfortable stay. There are outdoor swimming pools and terraces for some time out, surrounded by fields and karst mountain views. Restaurants are situated practically on the doorstep of this hotel, plus the Vang Vieng Morning Market is also within easy walking distance. This hotel is a particularly good place to soak up stunning sunsets. This newly built guesthouse is situated just a two-minute walk from the Song River. Rooms here are simple yet comfortable, with patterned feature walls, tiled floors, and en suite bathrooms. Maylay Guesthouse is located near to Vang Vieng’s post office, plus there is a wide selection of local restaurants and bars nearby; the town’s night market, as well as many of its sights, are located within walking distance. The hotel provides a laundry service and luggage storage, plus there is a tasty breakfast served each morning in the guesthouse’s dining room. Activities to make the most of the natural landscape can be arranged at the front desk, too. This modern, contemporary hotel is a towering building among the smaller guesthouses and boutique offerings throughout the area. The rooms are designed with comfort in mind and come with all the amenities you would expect from a modern hotel stay, including chic bathrooms. Some of the rooms even come with fabulous views of Vang Vieng’s famous karst mountain landscape. 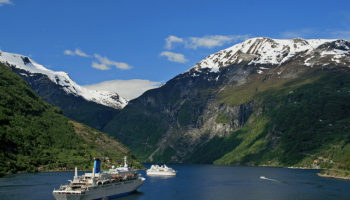 There is an impressive outdoor swimming pool where you can swim with views of the natural world. 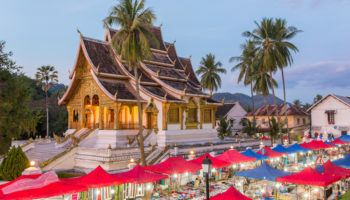 An onsite restaurant provides the option for evening dining, but nearby are plenty of eating and drinking options, such as the famous Luang Prabang Bakery and Sakura Bar. A high-end option in the rustic style, this is the perfect choice for nature lovers. 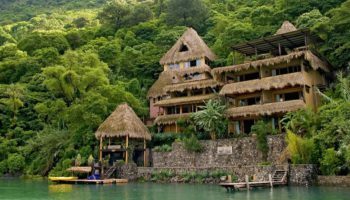 Accommodation here consists of thatched bungalows that sit high on stilts and are connected by boardwalks for a truly natural stay. The interiors are stunning, with polished wooden walls, large beds, and stylish, polished concrete en suite bathrooms. Candlelit evening meals can be enjoyed on the hotel’s terrace as the sun sets over the beautiful karst mountains. 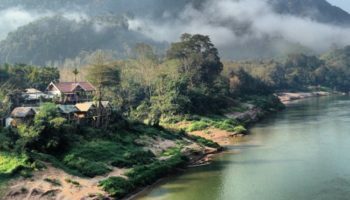 Set slightly away from the center of town, the Song River is just steps away from Vieng Tara Villa for a quiet and tranquil stay. The hotel provides a convenient free transfer from the bus station. As the name suggests, Riverside Boutique Resort is set right on the banks of the Song River, among grassy and manicured tropical gardens. 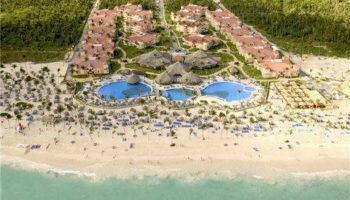 Designed around the style of French-era colonial architecture, the buildings at this resort are large, and the rooms feature whitewashed walls and terracotta tiled floors; there are also traditional touches with fabrics and other details. There is a stunning swimming pool here surrounded by sun loungers, plus an onsite restaurant where you can enjoy Lao and French dishes. There is even a gift shop. 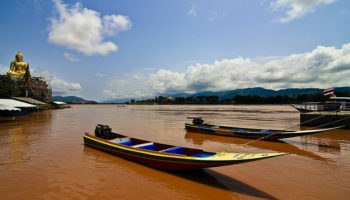 Nearby, guests will find the Vang Vieng Market and the Tham Nam Water Cave. 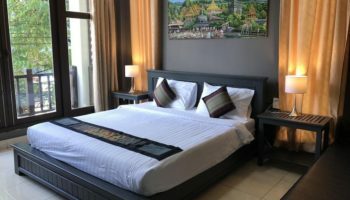 Another Vang Vieng accommodation offering that is located on the banks of the Song River, this hotel is just yards from the Tham Chang Elephant Cave and the renowned Organic Mulberry Farm. 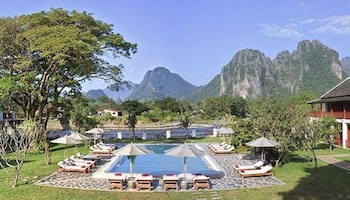 Simon Riverside Hotel boasts a large outdoor swimming pool and a sun terrace complete with uninterrupted views of the amazing karst landscape that Vang Vieng is famous for. The rooms are modern with minimal design and large hardwood furnishings; some rooms come with their own private balconies. There is a breakfast buffet served up each morning in a spacious dining room with huge windows that allows for views of nature, which is an excellent way to start any day.